Read my magazine article for BC Living's fall food issue in print and online. I shared my picks for "10 Things to Put in Your Mouth" (full list below). 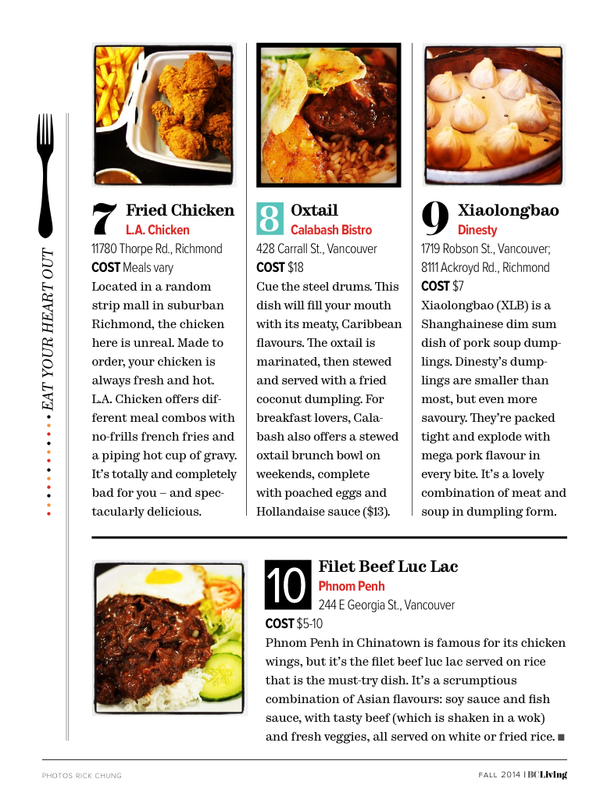 I was tasked to choose ten different dishes from Vancouver restaurants that you must try. From everyday eats to fine dining, appetizers, entrées, breakfast, dessert, and greasy spoons, I tried to compile a diverse list of delicious cuisines and dishes. You can check out the web version here and on the iPad app. Or pick up a copy. 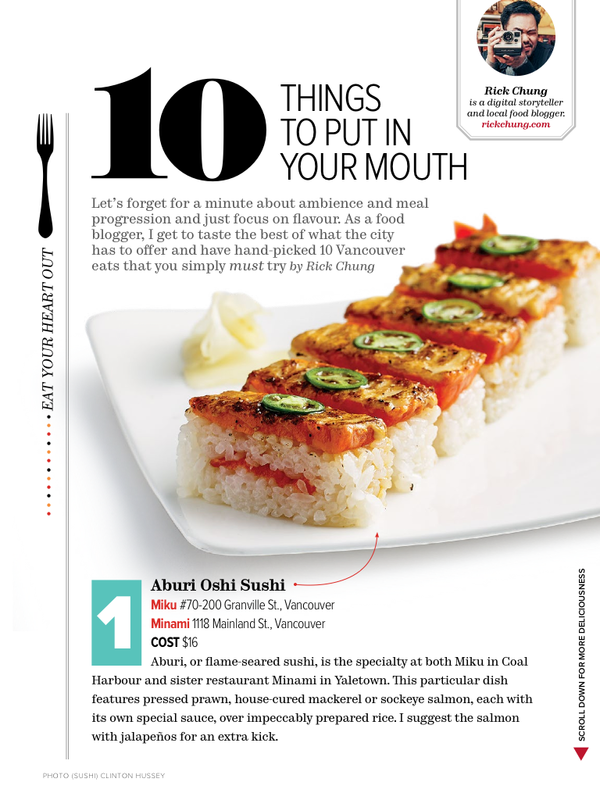 1) Aburi oshi sushi from Miku/Minami Restaurant at Waterfront/Yaletown. 2) Miso ramen from Hokkaido Ramen Santouka on Robson. 3) Steak frites from Bistro Wagon Rouge in Grandview-Woodland. 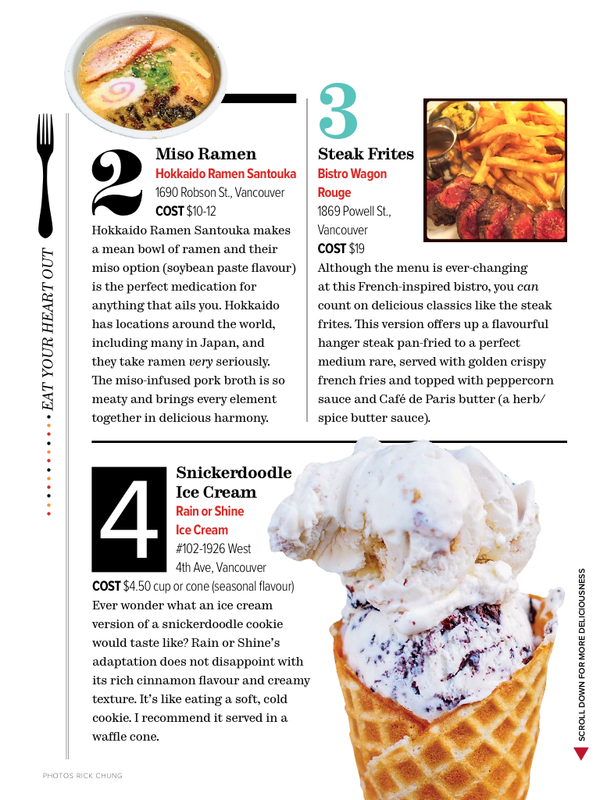 4) Snickerdoodle ice cream (seasonal) from Rain or Shine in Kitsilano. 5) Currywurst from Bestie in Chinatown. 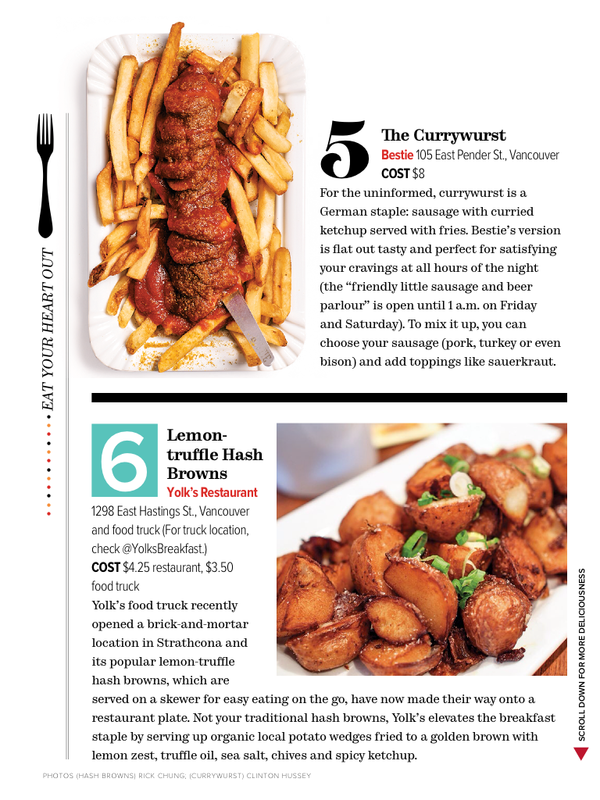 6) Lemon-truffle hash browns from Yolk's Breakfast on East Hastings. 7) Fried chicken from L.A. Chicken in Richmond. 8) Oxtail from Calabash Bistro in Gastown. 9) Xiaolongbao pork soup dumplings from Dinesty in Richmond/Robson. 10) Filet beef luc lac from Phnom Penh in Chinatown. Special thanks to editors Michael Small, Janine Verreault, and Oliver Lam for making the feature happen.